After fifteen years in the creative staffing industry, I felt the time was right to make a change. I had always loved interviewing and working with UX designers so I figured why not pursue that passion. Mutual Mentor is the school project that got it started. In 2014 I enrolled in the UX Design course at General Assembly. During each class we were taught the essential ingredients to UX design, such as user research, sketching, information architecture, and prototyping to name a few. All the while repeating our mantra, "I am not the user." What we learned during the three months would culminate in our final projects. These projects would help guide us along throughout the class and we would present the end result on the final two days. Our assignment for these projects: fall in love with a problem. Having just finished the Web Development Immersive course prior to starting my UX class, I kept hearing individuals with a business plan complain that they couldn't find a technical co-founder to help them execute their vision. This appeared to be a problem...one that I could fall in love with. During the initial phase of my research, I realized that a founder finder network might not be the right direction. I had jumped to a conclusion too quickly. I had the right problem, but my research was leading me in the direction of mentorship. 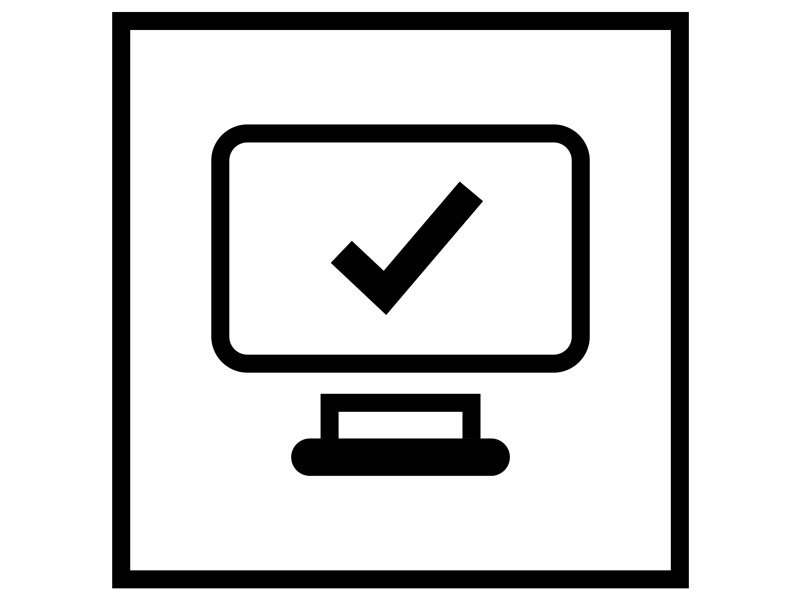 The curriculum for the General Assembly UXD course was focused on a user-centered design approach. Each segment was given equal time and emphasis as to it's merits when approaching a challenge. The interview field guide was the first step in the process. 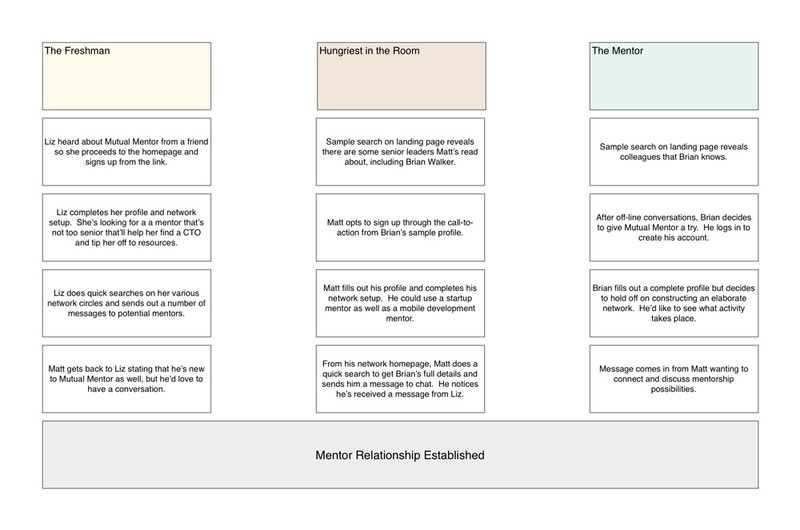 Because I made a slight pivot from founders to mentors, I created this second version when I went back to re-interview some users. Through the interviews, it turned out that I was looking a three different users of this product: the fresh out of school individual, the mid-level entrepreneur, and the senior level mentor. Each had a unique need for a solution such as this. As my project began to take shape, I found two products on the market that appeared to be competitors. But as a testament to the speed at which things move, by the time projects were due, one of those competitors had pivoted leaving only one that warranted competitive assessment. Because I had three personas that would come to the solution from different directions (and eventually interact with each other), I wanted to visually illustrator that journey. Knowing what I know now, I would utilize a swim lane diagram to better illustrate the journey. 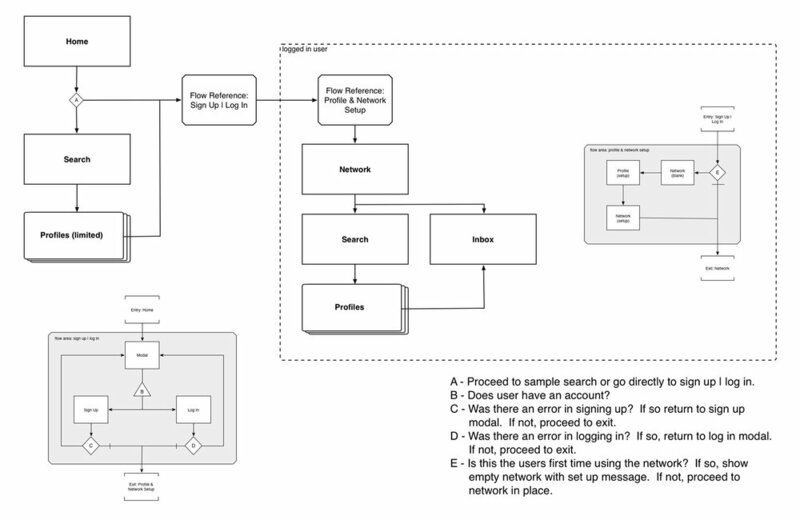 Utilizing the vocabulary of Garrett IA, I built my process flow in OmniGraffle. The intention here was to technically illustrate the flow a user would go through when they first used the product. 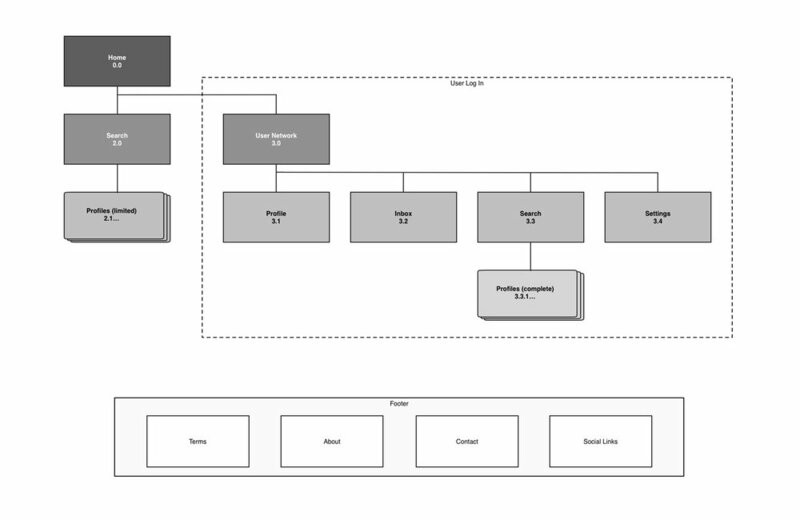 The site map for my project wasn't very complex. I wanted to give a newcomer the ability to try out some of the functionality and see profiles with limited information in hopes that they would be drawn in, wanting to see more. Through sketching I worked through various ideas for navigation, landing page concepts, and user journeys. 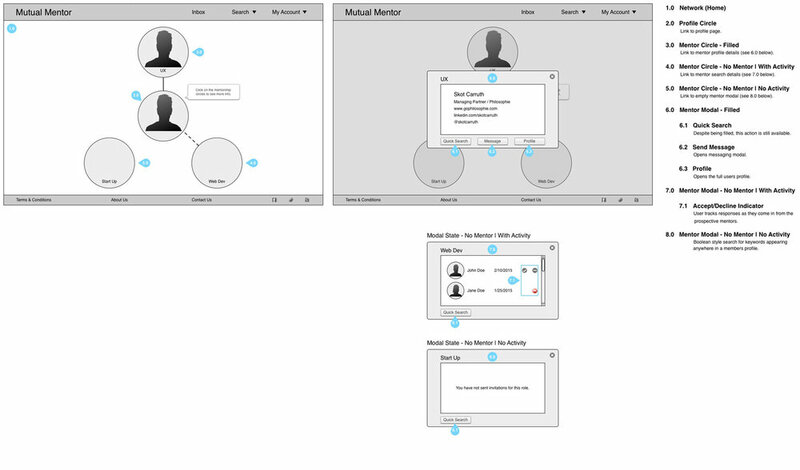 One idea that I kept tossing around was that of an on-boarding sequence that would assist the user. I eventually set the sequence aside in favor of more helpful affordances on screen. 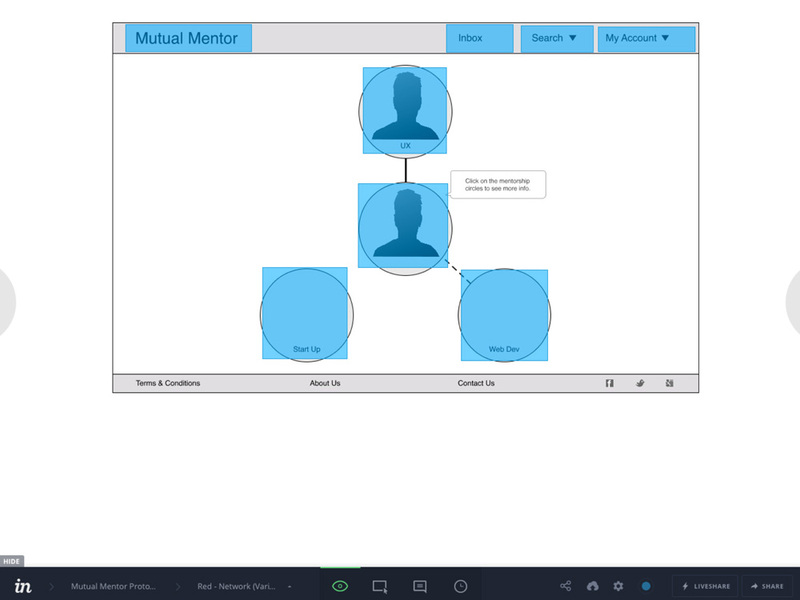 Mutual Mentor was built from the perspective of a desktop solution. I hadn't yet been exposed to the idea of mobile first, so the desktop frame of reference as a first step just came natural. Also, because the home screen experience relied on network visualization at a glance, the extra real estate was helpful. The class was introduced to a few prototyping tools. I ended up gravitating to InVision. As a class we discussed the concept of the "happy path" but were strongly encourage to prototype for all possible interactions. It was a lot of work, but great practice. We conducted usability tests on three classmates during class and I conducted one more on my own. The main takeaway from the tests was that I needed to help the users out a little and address zero-state situations. It's hard not to feel nostalgic looking back on this project. It simultaneously feels old and quite recent. Regardless, the duel mantras of "I am not the user" and "fall in love with a problem" are timeless and greatly impact the way I work today.